We’re confident that our dedicated experts will be able to provide you with the answers and the results that will make your trip down to meet us every bit as successful as you hope it to be. That’s what sets the Bathurst Toyota team apart from other dealerships – we build relationships with our clients and get to know who you are and what you’re looking for. This ensures that when you come back to us that you’ll find the friendly and effective service that makes a difference. On our lot we’re pleased to have an impressive selection of new and pre-owned trucks to suit your search better and help you get back on the road easier than ever before. After all – we’re talking about Toyota trucks here. These marvels of modern engineering have all the advanced features and sophisticated technology highlights that drivers are looking for – just come down and test drive one today and we bet you’ll be impressed by what Toyota and our team have to offer. When it comes to Toyota trucks in New Brunswick, the choice is clear – Bathurst Toyota. We want you to know that results are waiting for you when you work with the Bathurst Toyota team. But more than that, we want you to know that when you work with us you’re going to find the respectful and honest feedback and guidance that connects you with the right truck for you. 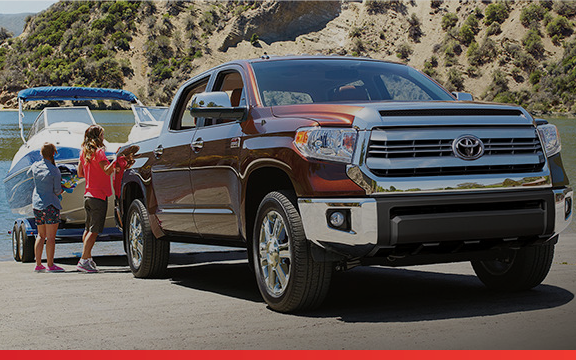 Consider what you’ll find when you step into the driver’s seat of the Tacoma or the Tundra. When you step up to the Toyota brand you know you’re going to experience luxury and practical capabilities that meet standards and exceed expectations. 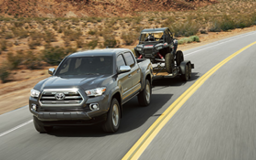 Join us today and get to know all the amazing features that the Tacoma and the Tundra have to offer modern drivers. 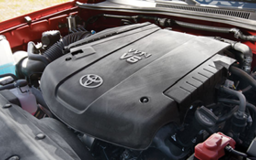 For instance, you can pick the 4-cylinder powertrain with 2.7-Litre engine that will get you 159 horsepower on the Tacoma, or pick the 3.5-Litre V6 for 278 horsepower. 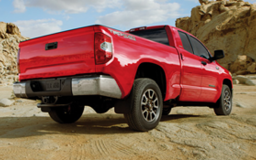 The Tundra makes life easier for those who want to be able to tackle the tough jobs. Offered in 22 configuration options, the Toyota Tundra has everything you could want – including a towing capacity of up to 4,625 kg (10,196 lbs). Find out more today at Bathurst Toyota! You’ll find that the Tacoma’s transformation over the years has been particularly amazing – and the results of all the engineering and development has resulted in a truck that has no equal in its segment. So, whether you want to choose the 2.7-Litre engine or the 3.5-Litre model, you’re going to have plenty of reasons to get out and explore with this impressive addition to the Toyota family. Class-leading off-road capabilities with available Multi-Terrain Select and technologies that include approach and departure angle warnings ensure that you are always on top of whatever life puts on the road or off of it with you! We already hinted at the power that comes on the Tundra – and isn’t it something? When you’re looking for a vehicle that can step up and show others how it’s meant to be done – you’re looking at the Tundra. Note that you have the options between the highly-capable 4.6-Litre and 5.7-Litre V8 engines – to get up and go. Suspension-wise, the Tundra is really worth checking out – with double wishbone suspension system with coil springs, gas shocks and stabilizer bar up front, and heavy duty multi-leaf springs and bias mounted gas shocks in the rear, you’ll be in good form. Or step up to TRD Offroad Packages for even more opportunities to show off and get out and explore! There are 10 options and 22 packages available on the Tundra alone. This really means that you’re going to have your personality showing when you narrow the options to the one you want. Check out all of these and more when you work with the Bathurst Toyota team. Similarly, the Tacoma will give you appropriate pause for consideration when you find out that it has 3 options for the Double Cab model and 5 options for Access Cab body types – well, you know you’re going to find what you’re after – easily – at Bathurst Toyota! You know you deserve a truck that steps up to the toughest jobs without complaint – and this is precisely why you’ll find a variety of options and personalization possibilities from the Tacoma to the Tundra. With numerous models awaiting you – you’ll be able to choose from the best of the 4×2 and 4×4 models on our lot – along with cabin sizes and cargo bed lengths – these are the trucks that have been carefully optimized for modern drivers. These are the trucks that you deserve to drive! When it comes to finding a dealership that has the resources and the opportunities to help you get into the driver’s seat of the right vehicle or provide the maintenance that keeps you on the road for longer – trust Bathurst Toyota. Not only because our dedicated experts have earned us a reputation for going above and beyond, but also because you can be confident that we’re going to do more to live up to the Toyota brand. It’s never been easier to find Toyota trucks in New Brunswick, and the time is now to start looking!